Fiberart International 2019 exhibiting artist, Beth Blankenship, is coming from Alaska to teach a one-day workshop. Students will be introduced to a technique that will give their beadwork a new dimension. Sculptural peyote stitch uses just beads, thread, and tension to create 3-dimensional objects. Add a new skill to your art practice toolbox. 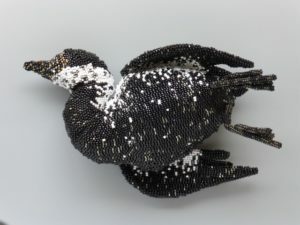 Image credit: beaded sculpture Oiled Eider by Beth Blankenship.